While doing some research for my next article, which was supposed to be ‘preparing for your new pup’, I stumbled across something about which I am decidedly undecided. Furbo Dog Cameras. Watch and chat with your dog remotely all day, while tossing her a treat here and there. The unit can also be programmed to toss treats at intervals you choose! Through interactive technology you pooch will never feel alone again. Mighty interesting, I have to say, but seriously folks. Is this really necessary? Or is this item a needless venture to get dog owners to open their wallets? Furbo Dog Camera- the only smart camera designed for dogs. It lets dog parents see, talk and Toss Treats remotely. The first thing that pops in my mind is, dogs have no concept of time. So, what’s the point? Yes, dogs can begin to expect your arrival, being fed and all, at certain times. That’s different, though, than being able to actually determine a length of time. My dogs bounce all over like they have not seen me in days when I just walk out of the bathroom! Other times it is difficult to roust them because they would rather sleep! Sure, dogs know when they are alone, but they do not count minutes or hours like we do. At the same time, I have seen dogs deteriorate in their behavior the longer they are left alone. I personally attribute this to the fact that they do need regular, repetitive interaction to learn, maintain and grow in good behaviors. So I suppose, for those whose workdays take them elsewhere for hours on end, a Dog Camera may come to be a vital tool. …and a mighty fine price tag, between $150 to upwards of $300 per unit. Amazon offers several brands and versions. However, Amazon ranks Furbo Dog Camera as “the Best Seller” with the average of a Four Star Customer Rating. Why? Most likely because Furbo is the only product of this type that has Bark Alert. This feature detects when your dog barks and sends you an Alert to your smartphone. Dogs bark for all sorts of reasons, but barking is one of their primary means of communication. Bark Alert on the Furbo is customizable to your and your dog’s specific needs. Also, this has other Smart Dog Alerts that notifies you when your dog is active. This feature can distinguish between a dog and a human, and will even let you know when a person is present. 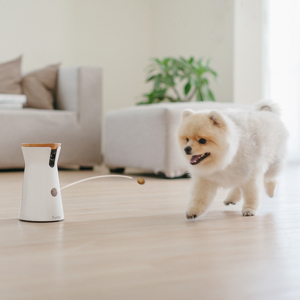 The Furbo Dog Camera also emits a “click” just prior to tossing a treat to your pup. This helps him learn to anticipate the treat and, hence, interaction with you while you are away. This interaction simulates what is commonly known as Clicker Training. With the 2-Way Audio you can give the dog commands, or simply check in on him. I do find it interesting to have the ability to train a dog from such distance! Especially when I think of all the hours most folks must be away from their homes, the idea that some of that time can be effectively used does sound exciting. This technology could help cut down the numbers of dogs that end up in the pound simply due to lack of training. The Furbo also has automatic Night Vision, which is incredibly handy for those who work at night and do not want to leave a bunch of lights on. This unit is designed to be “spill-proof” and the fabulous picture quality is a rave among its customers. Furthermore, from what I have researched thus far, Customer Service at Furbo Dog Cameras blows others out of the water. This, in my opinion, is a must for any company I deal with. For a middle-priced unit that has features unique to its competitors, I must say I am inching toward considering this a good buy. 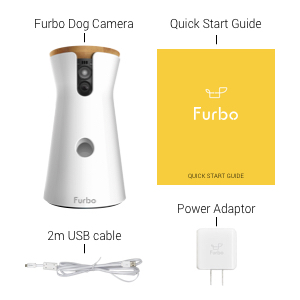 The Furbo Dog Camera is AI powered and “learns” the habits and patterns of your dog and household. It can also be linked with other technology, such as Alexa. Personally, this sorta stuff sounds creepy. Call me a nut, but I am not fond of technology “learning” my home or life. With every new technology come new avenues for hackers. Too, it is my opinion that most folks nowadays are way too caught up in tech-assisted lives! But do the benefits outweigh the creepiness? Other than the creepy factor, I could find nothing negative produced about this dog camera. Price to features considerations, the Furbo does seem to be the best buy for dog owners that want the security of monitoring, interacting and sharing with their pooches 24/7, no matter where they are. Key Tip #1: Evaluate your personal situation to avoid getting caught up in the latest fad. Key Tip #2: Do your research! Key Tip #3: Emphasize, prioritize and have fun with actual (face to face) time with your pup. Nothing can replace your hugs, not even 100 treats a day!